Chrysmela earring backs lock investment piece earrings and sentimental favorites in place so you don’t have to worry about losing them. They are made with gold- and platinum-coated surgical stainless steel to be long-lasting and to blend seamlessly with the look of high-end earrings. Eri Kikunaga came up with the idea to make earrings more secure after a fight (and break-up) with a boyfriend over—you guessed it—a lost earring. The key to Eri’s fortified earring back design is nine precision-machined parts including three micro ball bearings that lock an earring in place. The back auto-adjusts to the post and will hang onto the notch in the post as an extra security measure. 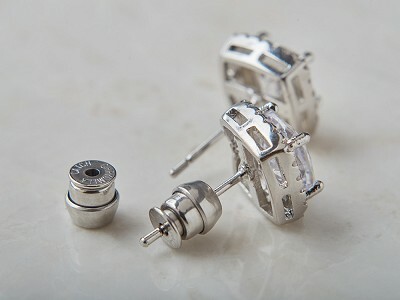 The earring backs are made in Japan at high-tech factories that also make smartphone cameras and watch mechanisms because Eri wanted her backs to be made to precision. That attention to detail results in an earring back that won’t budge—and that can provide lift for heavier earrings, too. With a pair of these backing up your earrings, you can wear favorite pairs with confidence that they’ll stay put no matter what you’re doing. Do the backs fit all earrings? No. 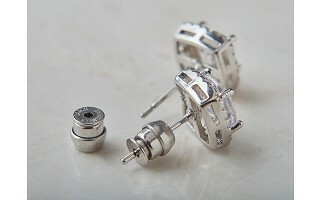 The backs support straight earring posts measuring 0.6 to 1.1 mm in diameter. Most earring posts currently on the market measure 0.7 to 0.9 mm with the end notch. Yes. 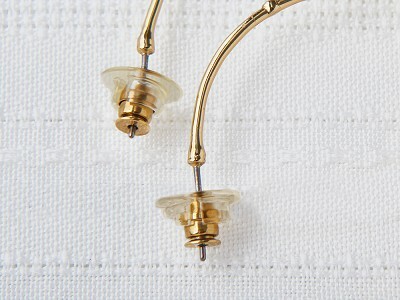 The earring backs are made of surgical nickel-free stainless steel and coated in 24k gold or platinum so they are hypoallergenic and corrosion-resistant. Do the backs work with screw posts? In general, they work well on screw posts but the threads on the posts may make it difficult to insert the backs and also may become less rigid and deep over time with the friction against the precision internal mechanism. Chrysmela earring backs lock investment piece earrings and sentimental favorites in place so you don’t have to worry about losing them. They are made with gold- and platinum-coated surgical stainless steel to be long-lasting and to blend seamlessly with the look of high-end earrings. Eri Kikunaga came up with the idea to make earrings more secure after a fight (and break-up) with a boyfriend over—you guessed it—a lost earring. The key to Eri’s fortified earring back design is nine precision-machined parts including three micro ball bearings that lock an earring in place. The back auto-adjusts to the post and will hang onto the notch in the post as an extra security measure.